Do we have the same concerns? When I look at my photos, my face look quite flat and wide, well this maybe one of the concerns that Asian girls are facing. Is there any quick fix for this? 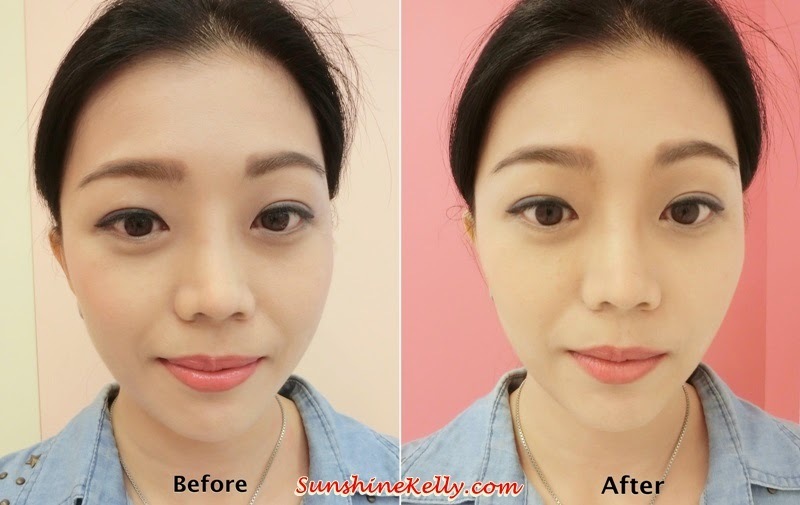 Recently, I tried the Benefit Cosmetics Hoola Bronzer and I found some tricks. As you know, majority Asians don’t really like tan skin so what is the purpose of me using the bronzer? Tell you a secret I found out the Benefit Cosmetics Hoola Bronzer is awesome for face contouring. The texture is powder and in matte format. Color is brown, darker than my skin tone. With one swipe I can see the color stay on my skin. I would say that the pigment is moderate. Which is suitable for contouring purposes, we want to create the more natural 3D effect not the heavy contouring effect. That is why Holla is called soft bronzing powder. Just gently sweep Holla underneath the check bone. Sweep upward below the jawline to create a V shape face and also I use the Benefit Cosmetics Powder Shadow Brush to create the contour on my nose bridge. Tadah! Can you see the difference the before and after. The nose bridge looks higher, jawline is sharper and cheeks looks more prominent. It is not that obvious but it looks natural on photo and also live. Wow! love the effect. Overall, I like the soft matte contouring effect. The color is not too dark or orange on my skin. The color stays well and easy to blend plus suitable for my skin tone. For some you may think the price is a bit high, I think is quite reasonable the most important is the effect and we only use a bit to create the contour and 1 box can last quite long. Ingredients: Talc, Mica, Polyethylene, Ethylhexyl Palmitate, Dimethicone, Zinc Stearate, Magnesium Myristate, Phenoxyethanol, Boron Nitride, Lecithin, Methylparaben, Tocopheryl Acetate, Fragrance (Parfum), Glycine Soja (Soybean) Oil, Tocopherol, Bht, Retinyl Palmitate, Butylparaben, Ethylparaben, Limonene, Isobutylparaben, Propylparaben, Linalool, Hexyl Cinnamal, Benzyl Salicylate, Citral, Butylphenyl Methylpropional, Citronellol N° 3n5503.